Following a successful trial in early 2015, August 2016 saw Wellington City Council go live with Smart Parking’s SmartPark solution, and parking payment app PayMyPark. The deployment includes a network of over 3,800 RFID equipped SmartEye vehicle detection sensors which register whether each parking bay is occupied or vacant. The information is fed instantaneously to the PayMyPark app, a simple to use app which provides drivers with real-time parking availability, guides them to free spaces and allows them to pay for the parking session straight from their smartphone device and extend their time remotely. 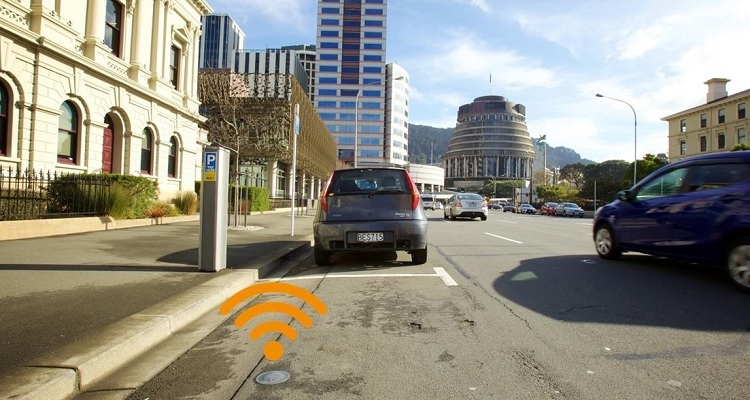 Data is then relayed live to SmartRep, Smart Parking’s powerful cloud-based software tool, which collates and analyses the data and will be used by the Council to understand how drivers use it’s parking spaces – a vital resource in planning further improvements to Wellington’s parking systems. Once parked, drivers simply enter the bay number into the app and press ‘start’ then continue at their leisure. Upon return to the vehicle they then select the ‘stop’ function therefore only paying for the time they use. Smart Parking’s infrared sensors automatically detect when a car arrives and relays the information to PayMyPark alerting the application of the cars arrival and departure. Drivers are also given the option to pay in advance. If they return before their parking session has expired they will receive a refund for the remaining minutes to their parking account. The app will also generate alerts when time is running low, and will allow the user to top up the parking session from anywhere.